Treatment options need to be tailored according to the situation to gain eradication (or in long wool, effective control). An understanding of available products, the best way to apply treatments and factors need to be taken into account will help you ensure that treatments are effective. Chemicals registered for lice control include organophosphates, synthetic pyrethroids, insect growth regulators, spinosad, macrocyclic lactones, a neonicotinoid and a combination of magnesium fluorosilicate, rotenone and sulphur. It is important to be aware of the characteristics of the different chemical groups, in particular their safety profile, residue consequences, withholding periods, modes of action and whether resistance has been detected. These are described in the LiceBoss Note: Sheep lice treatments—chemical group characteristics. The LiceBoss Products Tool lists all of the products currently registered for lice control in Australia, the chemical groups to which they belong, their method of application and the wool and meat withholding periods for each, together with their approximate prices. When lice are found, economic and animal welfare considerations dictate the need for sheep to be treated with an effective product. The choice of product and the timing and method of treatment should be determined by a range of factors. 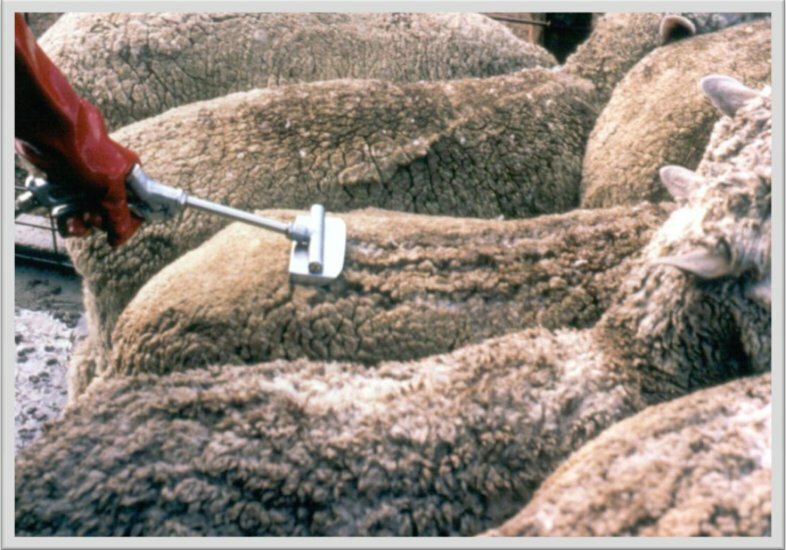 Products from several chemical groups are registered for the control of lice on sheep with intended use being lice eradication. Depending on the product chosen, the best time to treat sheep for lice is ‘off-shears’ (i.e. within the first 24 hours after shearing) or in ‘short wool’ (i.e. from 2 to 6 weeks after shearing). These treatments should be able to eradicate lice if applied according to label directions. However, resistance has occurred to some chemical groups, rendering them ineffective against some lice populations. This needs to be considered when choosing appropriate treatment strategies as resistance reduces the number of control options available. Good management should include precautions that minimise the chance of resistance occurring. The availability of suitable equipment: existing equipment found on many farms does not deliver the chemical treatment effectively. Beyond these factors , also consider labour required and the speed and ease of use. Long wool treatments (products applied to sheep more than 6 weeks after shearing) will reduce louse numbers, but will not eradicate lice. Mobs treated in long wool will need to be treated again after their next shearing to eliminate an infestation. It is easier to eradicate sheep lice on farms with one main shearing than it is on properties where mobs are shorn at different times (split shearings). Similarly, flock management becomes more complicated where pregnant ewes or ewes with lambs at foot need to be treated for lice. This is because backline treatments and insect growth regulator products take some time to bring about the death of all lice. During this time, if there is contact with other untreated sheep, there is the potential for lice to spread. Where split shearings occur, it is critical that treated mobs are kept separate from untreated sheep for the period specified on the label. Managing ewes with lambs at foot or ewes due to lamb soon after treatment is more complex. LiceBoss contains a specific Ewe-lamb Treatments Tool and a LiceBoss Note: Sheep lice control for ewes and lambs to assist producers determine the best course of action for this situation. When lice infestations are found between shearings, a decision to treat in long wool, to wait until the next shearing or to shear early is required. Left untreated, wool damage may become significant. Alternatively, the cost of treatment may not be warranted if wool damage is unlikely to be severe. Long wool treatments will not eradicate lice and regardless of whether or not a long wool treatment is applied, sheep will need to be treated again after their next shearing. The Long Wool Tool in LiceBoss can help you to decide whether it makes better economic sense to muster the sheep and apply a long wool treatment, or to wait and treat the sheep after they are next shorn. Early shearing is rarely the most cost effective choice, but can be considered if the early shearing time is convenient and it is essential to eradicate lice immediately rather than wait until the usual shearing time. There are two main methods of long wool treatment; hand-jetting and long wool backline. Consult the LiceBoss Products Tool for a list of products registered for long wool treatment in Australia. Refer to the LiceBoss Note: Hand-jetting sheep for lice control for instruction on the effective hand-jetting for long wool lice control. For long wool backline treatments, read and follow the product label instructions carefully. Long wool treatments are often expensive to apply and some products have lengthy wool withholding periods that prohibit their use close to shearing. For maximum flexibility in treatment options, it is important to monitor for lice regularly so that new infestations are detected early.